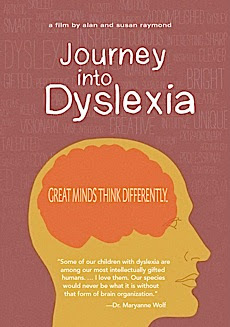 Academy Award-winning filmmakers Alan and Susan Raymond present Journey into Dyslexia, profiles of dyslexic students and adults who share their experiences of struggling in school and then succeeding in life. Each share their frustration with being misunderstood by teachers and friends and the emotional impact this learning disability had on their lives. Dr. Guinevere Eden, Director of Child Development at Georgetown University, explains the causes of dyslexia. Other experts include Dr. Mary Anne Wolf, author of Proust and the Squid, who describes the difficulty of learning to read for everyone. The journeys into dyslexia are told by students ranging from 2nd grade to college plus entrepreneur Steve Walker of New England Pellet, inventor Ben Foss of Intel, author Jonathan Mooney, consumer advocate Erin Brockovitch and Nobel Laureate Dr. Carol Greider.urrently pursuing a Master‘s Degree in Multicultural Education.